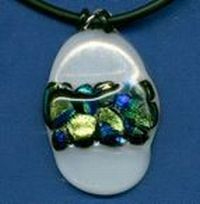 This workshop is a fun introduction to glass fusing. No previous experience in glass is necessary. You will learn how to cut and fuse glass in a kiln (melting pieces of glass together to form an object). The simple projects will have you creating glass jewellery, light catches, "flat critters", wind-chimes or plaques. There will be an opportunity to create several small pieces. As the glass will not come out of the kiln on the same day, you will have to arrange to pick up your creations the following day. Students should wear covered footwear (no thongs, sandals), and bring a notebook and pens. All materials, equipment and morning tea or coffee will be supplied. (Bring your own lunch.) Max 10 students. This workshop will be an introduction to glass fusing through the creation of simple glass components that will then be assembled into neckpieces, earrings, bracelets or brooches. 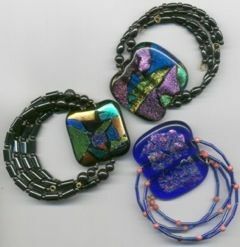 No previous experience in glass or jewellery making is necessary. The workshop will cover cutting and assembling the glass components including dichroic glass, crushed glass and stringers, before being fired in a kiln. This workshop builds on the experience gained in beginner classes of basic fusing, but is still open to learners who are willing to play “catch up”. Skills learned in previous classes will be expanded upon. In this workshop you will learn to turn a flat fused piece of glass into a bowl or plate. 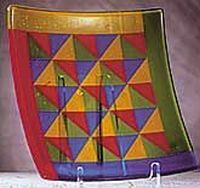 The finished bowl or plate will be more adventurous in design and the students will be introduced to more advanced techniques in fusing and slumping. Learn how to texture glass, use crushed & powdered glass, stringers and have fun with inclusions between layers of glass. You will first fuse 2 or 3 pieces of glass- (Fusing – joining pieces of glass together by melting them in a kiln ending in a flat piece of “fused” glass). These flat pieces will then be slumped, draped or sagged to form bowls, plates or vases. As the glass will not come out of the kiln on the same day, you will have to arrange to pick up your creations the following day or later. Students should wear covered footwear (no thongs, sandals, and bring a notebook and pens. All tools, materials and morning/afternoon teas & coffees included in cost. (Bring your own lunch.) Max. 10 students. The cost of each workshop is $60 for Cairns Potters Club members and $65 for non members. If you are interested in one or some of the workshops please contact Lone White (phone 40537508) or email loneATtpg.com.au as soon as possible as each class will only take 10 participants. To get a booking you need to pay your money straight away - not on the day of the workshop. The workshops will be conducted at the Cairns Potters Club, 28a Grove St. Cairns. The workshops are rapidly filling up, however the club will be willing to repeat some of the workshops at a later date.